A Year in Review: New Name, New Products, New Packages and a Sale! There’s a reason it takes 100-person companies many months and often the better part of a year to start and finish a rebrand. It’s because it’s a lot of work! I mean, every time you change one tiny detail—like the quantity in the bag (which affects the nutrition and instructions), like the acquisition of a different brand of AWESOME parchment (that changes the instructions), like the name (well that’s a big thing, but you get my point) a whole waterfall of things needs to change along with it. I won’t bore you with all the details. But suffice it to say, it’s a gargantuan job. And if you want to do it nicely, you have to wait for certain details to gel before you can call one step done to move onto the next. And when you realize you need to change an earlier step, it starts all over again! So after a year of working on it, I’m very proud to unveil our completed rebrand. It’s been a labor of love and the result is beautiful, if I say so myself. This name is the result of combining our mission, which is uplifting people, with the predominant quality of our food which is uplifting your prana, and the bit of attitude we like to embody, which brings power, and prana, to the people. You get it, right? And maybe we’ll have a ready made jingle! Back in 2007 when we came up with the idea of Prana Pancakes, Prana was not yet a crowded name space. In fact, many people didn’t even know what Prana meant! Our original idea was to have each product be called Prana + (the specific food name.) But, many others have grown to love love the idea of Prana, and after the passage of several years we began to feel that it could cause some confusion if we kept it so generic. We will have a chai product eventually, and there is now another company called Prana Chai. We knew we needed to keep Prana in the name. After all, there’s no other way to explain what high prana foods are. But it needed to be unique enough to stand as a distinct brand name for any product we could come up with. And we wanted the name to whisper “social impact” within the very name. And so, we bring you...(drumroll please!) Prana to the People! New Brand Pillars: PRANA as an Acronym. Should we say Prana Pillars? With the new name came a whole new feeling around our products, purpose and message. This brought to mind the existential question: Who has more impact? Product or Marketing? hahaha. :) It became a spiraling question and a spiraling process. The questions we had to answer: Who are we? Who are our customers? What is our mission? What are our brand pillars? The answers to these questions came easily and dovetailed together beautifully when we made the letters in PRANA into an acronym. Check out our new Brand Pillars! We love them. They look more artfully arranged on the back of the package, so be sure to visit the store as well! Special thanks to Christa Velbel, our amazing, creative and generous copywriter. New Packages: Do they remind you of Shepard Fairey? We hope so! Because we copied his style pretty blatantly. I’m a big fan of Shepard Fairey art. It’s gorgeous. It’s fanciful. It’s bold. It has an attitude, and yet it is infused with love, kindness and a whisper of divinity. In pop culture, it whispers or shouts “social justice and higher good” without saying a word. We wanted our new look to convey just that. And we’re still and always open to iteration. What do you think? Do you love our new packages just as they are? How could they be improved? Feel free to share in the comments. We love comments! Special thanks to Tania Vasallo of The Courage to be Happy. She is an expert in food branding and so generous with her gifts. Boy did we have a good time! New Products: We’re giving you Options! New Ease of Use: Our products are now Cookie Kits! Something we realized while we were creating our new products is that we wanted our customers to have an amazing and consistent experience. So, we took a step in that direction by making it a kit! It’s not just mix inside anymore. It also contains the parchment so they won’t stick to your cookie sheet. And not just any parchment! Our cookie kits contain the very best parchment ever made: by Zenlogy. Please thank them for partnering with us by buying their parchment when you finally need a sheet of it besides the one that comes in your cookie kit! You can also buy their parchment on Amazon. Their round sheets are perfect cake pan liners. Trust us, once you try this brand of parchment, you’ll never go back. It’s environmentally friendly and seems to last forever. I have only thrown away parchment because it got dusty and never because it burned or wore out. Other big name brands burn at high temperatures, stick to things, are weird shapes or have other issues in general. Zenlogy is perfect all around. We did make a few cookie kits before we partnered with Zenlogy, that have a bargain basement parchment in them. If you get one of those earlier ones, (it has white parchment in it) don’t worry, we’ll give you a 10% off coupon good for your next order. Just ping us by email or reply to your order confirmation to let us know. We already sealed the bags, so it’s too late to take it out. And bags are expensive, and you care about the environment so you wouldn’t want us to throw them away! So much love & ta ta for now! Come to our Community Launch Party this Saturday from 12 to 3! Can you tell I love cookies? And art? Did someone say cookies? I thought so! Ooooh, good. I do adore a fabulous, fresh baked chocolate chip cookie. Especially when it's organic, gluten free, and sooooo good. What, you're not in the mood for sweets? No problem! You can try our veggie burgers incorporated into Open Secret's already life supporting menu. Theme for the menu: "Put a Burger on it!" You will be able to savor our French Broad or our Thai Temple burger on a sprouted sunflower nori roll with avocado, on a kale salad, or on a noodle bowl. Yes, I'm getting hungry too just thinking about it. And I'm bringing my whole self to the party. There will be food to eat (of course! ), you will be able to purchase some as-yet-unavailable food products, and settle in for some story and song. Yes, there's a fairy tale about how we came to be. I bet you can't wait to hear it! And the world famous Carita will be joining us for Sanskrit chanting. And world renowned Debra will be leading a guided meditation. Seriously, it's fun for all. So don't miss it! Just click on the ol link and RSVP now! There is no charge for the event--it's just so we'll have some idea how much food we need. Come on now...just click it! Oh...if you haven't been to Open Secret before, you're in for a treat. It's a jewel of Marin--full of local delights, good vibes, organicness and hippie wonders around every corner. At 923 C Street in downtown San Rafael. Meet Kathie, our Operations Manager! Back when Kathie lived in St. Louis, Missouri (yes, you read that right, she used to live in the Midwest…and oh does she have a work ethic to show for it.) But I digress. Back when she lived there, she managed a cafe, including its 20 employees, all the logistics, schedules, receiving, private parties, inventory, production, retail sales, training, etc. One particular Thursday afternoon, with the usual 50 or so customers sipping coffee, hanging out and doing homework in the cafe, Kathie went to the back to receive a pallet of honey. An aura of cigarette smoke and machine grease wafted in with the delivery driver as he came through the door. Simultaneously, a giant thud and crack was heard. The entire pallet of honey had shattered upon delivery. After the briefest moment of shock, shrieking (and probably prayer), Kathie convinced the truck driver that the very best thing to do with the pallet of honey was to return it. She and team wrapped it up in a giant balloon of cellphone and packed it off. The six or so employees who were supposed to be attending to the 50 or so customers got redelegated. A few stayed in the back with mops and squeegees to clean up the sticky mess. After that it became the norm to bring a change of clothes to work every day—since you never know what you might end up wading in when you get a delivery! The customers in the restaurant went about their merry day with not a clue as to what had transpired in the back of the cafe. And our customers will never need to know when a delivery goes awry for us either, because we have Kathie. A big welcome, Kathie! We could not be more thrilled to have you on our team. Here's the kind of thing she'll be doing for us. You might see her at a demo if you stop by one of the stores that are carrying our products! We're at the Art of Living Center in LA for a few days enjoying some good company and the beautiful gardens. Thanks to our successful Kiva campaign, which you all helped us rock, we have a bagging machine and a blending machine on the way. Wahoo! This will help us make our cookie mix soooo much faster. Oh and in case you hadn’t noticed, cookie mix is in stock and available for purchase. If you have a favorite store where you want to be able to buy Prana Foods, let us know. We will give you a free case of Prana Foods products when you successfully introduce us to a store! Enjoy a lovely long weekend. And a one time 20% off coupon for anyone who can name the dog in the picture! We're Baaaaaack! And Better than Ever! It's soooo good to see you! It's been too long! But that's how it is when you have an inner nomad that whispers in your ear and your family listens to it too. :) But it's been a worthwhile journey. At last, we've wandered Home. So what were we talking about? Right! The cookie mix! It's back on sale and you can grab yourself some in our store and receive it by Christmas. And yes, that 20% off only lasts until we get supplies...the opposite of While Supplies Last! Did you check out our new packaging yet? Let us know what you think. Your cookie mix will arrive in the new packaging and we think it's really fun. Ok go! Check it out now. Hint...you have to click into the picture to see the new packaging. Take advantage of the sale while you're there! Maybe most exciting of all is that we're now a Delaware Public Benefit Corporation! f you know any of us Longneckers, you know that meditation and service are a central part of our lives and we care deeply about bringing more light and love to everyone we encounter. We are thrilled to be able use our business as a foundation for doing good in the world. To learn more about our social impact, check out our new social impact page! And sign up for updates specific to that. We're thrilled that we've hired our first previously incarcerated employee--on a part time contract basis. We've provided her training in the Art of Living, where she learned a simple breathing and meditation practice to relieve stress and live happier. We are working toward hiring her full time at a living wage, and in growth we plan to hire more system impacted people to help them move toward greater freedom, abundance and self determination. We're excited to be fundraising, partnering with the wonderful folks at Kiva! 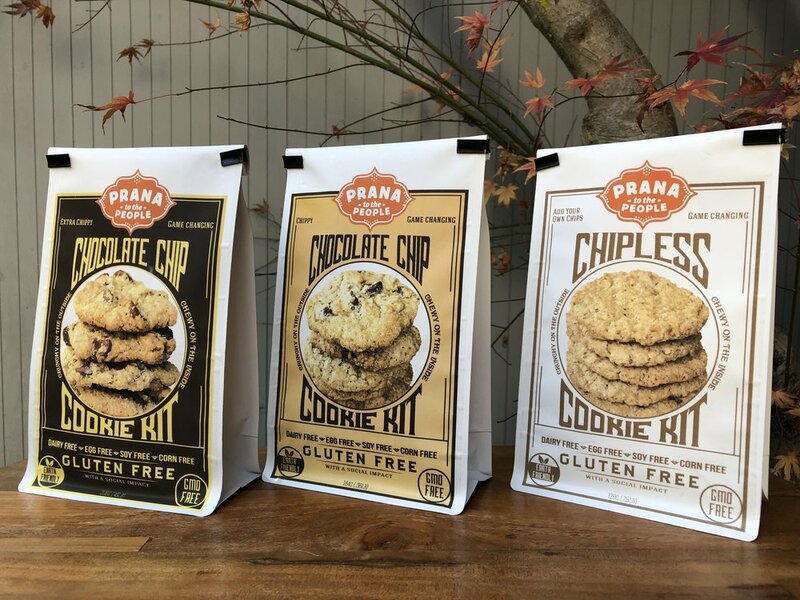 We're raising seed capital for this local launch and raising awareness about Prana Foods at the same time. Show your support by lending us $25 or more so we can hire our person full time, make more cookie mix for you, start making our pancake mix again and grow the business to do more good. We will have lots and lots of exciting updates in the coming weeks. Hint..don't spend your whole budget on stocking stuffers until you see what else is coming! Stay tuned for more gifts, recipes, stores and some wisdom and whimsy. Many blessings this Holiday season! It’s spring! Nearly summer in fact, and it was a muggy day today in Boone. I was on the phone when lightning struck—I felt a slight electrical jolt and the phone wigged out. Fortunately I’m fine and the call didn’t even go dead…it was just a little, well, shocking. Bad pun, I know! The best part of today was taking some new and improved, now soy free Thai Temple burgers over to Tom’s place. They are soooo good! We did a spontaneous photo shoot with Tom in his lovely bachelor pad overlooking the Blue Ridge. I happen to have a new iphone 5s (lost my dear old 4s!) and I was truly impressed by the photo quality. I was prepared not to like the new phone, so was pleasantly surprised. Let me know if you agree about the photos! Anyway that’s enough about phones. The great part was how beautiful the Thai Temple burgers looked poised over the Blue (and now partly green) Ridge, after Tom prepared them low-carb style, open face on gluten free buns with gorgeous green veggies on top – spinach, green chillies, a splash of red onion, and generous portions of avocado. Tom eats healthy bachelor food. Thai Temple and French Broad Burgers are Tom’s favorite dinner staple. Did I mention how amazing it all looked sitting atop the Blue Ridge? Thai Temple Burgers over the Blue Ridge. Gluten, Soy, Dairy Free Veggie Burgers that are Spectacularly Good! I'm sorry to tell you we aren't shipping veggie burgers yet BUT we have started our dry ice time tests with a few types of shipping containers. Go to our Veggie Burger page to sign up to know when they'll be available shipped to your door! In case you wanted to add an extra bit of pizzazz to your next batch of Thai Temple or French Broad burgers, here’s a super simple chutney recipe, that even a bachelor could make. I think even Birjoo (another bachelor) agrees, and he tried this chutney on Prana Pancakes eaten as dosas, just last week! But for now Salt is a subject very dear and tasty to my heart. Let’s all eat more salt. Good, pure, unprocessed salt. So why have we heard that salt isn’t good for us? That is partly true and partly a lie. It all depends on the salt. Before we start, please go in your kitchen right now, and throw away your Morton salt. Toss it. Please. Do it right now. And look at any other types of salt you have. Are they white? Throw them away too. Real salt is pale gray or pink. If it isn’t gray or pink, even if it is called sea salt, throw it away. Just do it. I’ll wait here. By the time you’ve finished reading this article, you’ll stop regretting that you threw it away and be glad you did. I love Real Salt. It honestly could be my favorite food, right up there with good grass fed butter. When I was growing up I couldn’t stand salt but after I had a child I began to love it and crave it. They say that generally, you tend to crave foods that are good for you (ok not saying you should eat sugar 10x a day but…), so I trusted it and ate more. It turned out to be an amazing thing to eat more salt, because I had been dehydrated without knowing it. Fortunately I had switched to Celtic Sea Salt (one of the good salts) at just the right time. Real Salt regulates the amount of water in the body. It is an electrolyte, which, simplified, means it keeps your body fit, strong, working properly and keeps you fresh and alert. Actually, it’s the minerals in the salt that have the electrolyte effect. It’s the gray or pink part of the real salt that does the electrolyte job. The minerals move things into and out of cells. Mineral depletion is a big problem because of the all the chemicals we ingest, including in table salt. About 80 different trace minerals are present in whole salts! Ingesting enough of these minerals can have a profound improvement on overall health. Studies on real, whole salt and uses in Ayurveda reveal that our various real salts have these startling effects that we do not usually associate with salt. If you want to know all its uses, google saindhava lavana. That is the Sanskrit name for Rock Salt. It is essentially the same as Himalayan pink salt in India, but do be careful of things labeled Rock Salt in the US. And, pink rock salt (sendha namak) and black rock salt (kala nimak) have different effects so check into them before using for a particular remedy. If you are on a low sodium diet, all of this might be making your hair stand up on end. I get it. You don’t have to take my word for it. Do a little more research. It’s shameful, but if you google “processed salt” the first link that comes up is from the Mayo clinic claiming that whole, unprocessed salt and processed salt are basically equal. This is nonsense. Another website even says the trace minerals in salt are “impurities.” This is also nonsense. That’s like saying white sugar and raw cane sugar are equal and the molasses in the cane sugar is an impurity. We all know it isn’t and in fact the minerals in the molasses help you digest the sugar. Salt is no different. Salt used to have an amazing reputation. That’s why we have terms like “Salt of the Earth” and “Anyone worth their Salt,” and that’s why Roman soldiers used to be paid in salt. It was a precious commodity. It made food taste good and gave them energy like nothing else could. In fact, the term “worth their salt” came from the way soldiers were paid. Any soldier who was “worth his salt” was worth his salary. Most chefs I know would tend to agree. Salt is precious. If you could only add one single thing to any dish to make it amazingly tasty, that would have to be salt. It has to be in the right quantity to bring out the best in the natural flavors of the food. The right quantity to bring out the maximum flavor, in my opinion, is usually just below the threshold of too much. I love foods with tons of flavor. Perhaps this is how I developed my taste for good salt. At Prana Foods, we only use Celtic Sea Salt. But you probably knew that already. It’s just a reminder that when you eat our flavor-bursting veggie burgers, our scrumptious pancakes (with that perfect threshold of salt that makes them taste buttery) and our heavenly cookies, you will be increasing your intake of all the healthy trace minerals that come with Real Salt. There are some that believe earth salt (Himalayan or Rock salt) is the best of all, and they may be right. I chose Celtic salt because I love the sea. In any case, choose Real Salt. Please rush out right now to Earthfare, TJs or Whole Foods to get your Real Salt. Okay, and I was weirdly and madly in the mood for some good salt (and dessert) after I wrote this article so check out what I made…Prana Cookies, then sprinkled them with Himalayan pink salt! Rather gourmet, I must say…there’s a reason salted caramel with imported aged sea salt flakes is a hit. 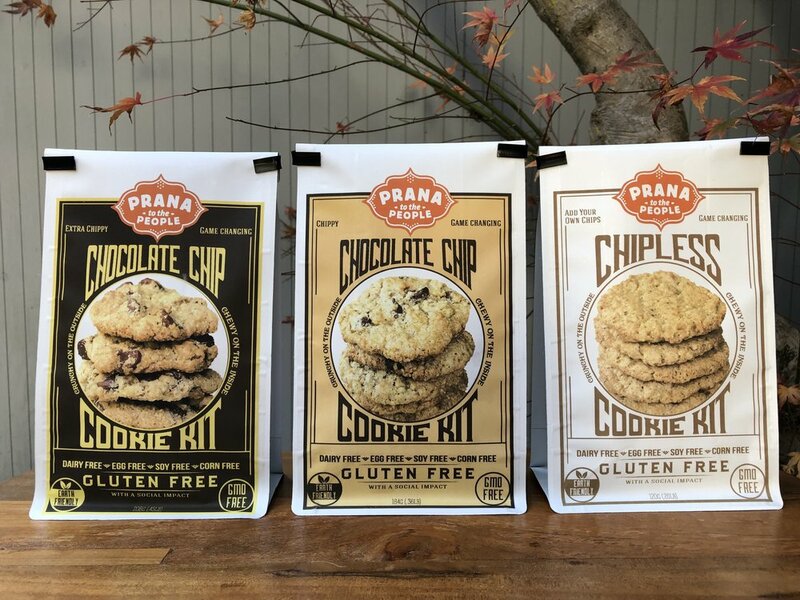 Gluten, soy, dairy and corn free Prana Cookies. Sprinkled with Himalayan Pink Salt! Weird but spectacularly good. As are the cookies just by themselves. Weird? Maybe. Good? Definitely! After this might have to up the quantity of salt in the cookie mix! Just kidding. But try it, seriously. To your good health, inner and outer beauty and enlightenment! And click here for the bonus recipe! It includes Real Salt. As always, we love comments! And if you like what you see here and didn't get here by email invitation already, sign up to receive nutrition tips and recipes directly in your inbox. We never share your information with anyone else. The importance of Probiotics for Those who are Gluten Intolerant, Celiac and Otherwise. We’ve all heard of Candida, right? Well, it’s my humble and politically-incorrect view that Candida and other gut disorders can be the CAUSE of Celiac and other digestive and autoimmune issues, and that it may be possible to CURE Celiac (and other autoimmune diseases) altogether. I once read an Ayurvedic article in a magazine on a plane or some other equally unlikely setting about gluten intolerance. It said celiac disease can actually be cured. Now that I can’t find any reference to that article, I wonder if I actually dreamed it! If it was a dream, it was a really vivid one. I actually put the magazine in my laptop bag to take home and research it more later. But after the flight, after unpacking, the magazine was nowhere to be found. Still, though, there is a big connection between Gut health (or lack of it) and gluten intolerance, and it needs to be explored. How many celiacs or gluten sensitive people do you know who have to avoid other foods as well? Astoundingly, over 50% of celiacs also have to avoid dairy or soy. Many others also avoid corn. In fact, many I know can barely eat anything at all, and are constantly turning down luncheon invitations because they don’t think we’ll have anything they can eat. Does this sound familiar? The good news is, if you heal your gut (common word used to refer to the small intestine) you may be able to eat more than you think after a while, and if you’re daring, and willing to be patient to heal your damaged gut, you might even be able to eat gluten again. While celiac is an autoimmune disease, it seems the jury is out on why it started. When candida proliferates in the digestive system, it digs into the intestinal lining. The body attacks it thinking it is dangerous. (Well, it is.) According to some experts, gluten protein is very similar to a compound in the wall of candida cells, and the body’s immune response to the candida causes the body to attack the similar gluten. The immune system then begins to destroy the villi in the intestinal lining, but it happens AFTER candida is already present. But regardless of why the body started attacking the villi, everyone agrees that it causes a problem. Once the villi are destroyed, the individual has little remaining ability to digest foods, and they get sick. But according to some, avoiding problem foods is only the first step in getting better. Avoidance might not be your only option. With a careful dietary regime over a few years that includes aggressive rebuilding of healthy intestinal flora, some practitioners believe it is possible to cure celiac disease completely. As a person who has been diagnosed with autoimmune thyroid disease, I do believe it is possible to cure. For years I’ve kept my thyroid happy by keeping my gut healthy. Gut health is the single most important factor in our overall health, and the medical establishment is catching on. Google “poop transplant” if you don’t believe me. To keep your gut healthy without going to such drastic measures, you need the right diet, and it needs to include probiotics. Probiotics are healthy bacteria (also known as flora) that help us digest our food. Healthy bacteria will keep naturally-occurring candida at bay and restore your gut health. If you are celiac and not getting better from avoiding gluten, try probiotics, in particular, kefir. If you can’t eat dairy yet, even without the lactose (because kefir grains eat the lactose in milk), try tibicos, or water kefir. Both can be made at home very inexpensively and you can be assured of the quality and purity by making it yourself. Some probiotic supplements may guarantee beneficial organisms in the billions or trillions, but I prefer to make it myself because I can guarantee it is powerful and fresh. If you’d like to make your own kefir, we’re selling kefir grains! For a limited time, while supplies last, we’re offering our extra stock. As it gets warm in Boone, our grains have grown like crazy and we have a few rather large ones to sell. These are the kind of kefir grains that grow big: a strainer is optional. You can reach in with your clean fingers and strain your probiotic drink. Check our shop if you want to buy some. By the way, our kefir grains are blessed daily. For the secular among us, that means our good intention sent out biophotons into the kefir grains to make them more powerful and effective. For the spiritual among us, that means we humbly asked God to bless them to make them more effective, powerful and benevolent. If you are serious about reclaiming your gut health, check out our cookies and burgers too! Both contain apple pectin (and the burgers contain chia seeds) both of which are known to improve intestinal health and remove toxins. By the way, if you want our burgers, we’ll deliver them to you in Western North Carolina! Use the contact form to let us know where you are and we’ll set up a delivery schedule. If you’re in Winston Salem, contact us and we’ll let you in on our secret source. What do you think? Can you cure celiac disease? Can you prevent it by keeping your gut healthy in the first place? Feel free to comment and let us know! Like this article? Want to argue with it? Sign up to receive our newsletter in your inbox! (there's a small link to the lower right of this post.) We’ll never share your contact information with anyone else. How Old is Ayurveda, Anyway? When fad diets are called "ancestral," it begs the question of how old they are and how their age compares to other options: in particular, Ayurveda. Let's take Paleo for instance. It's hip right now. Paleo advocates claim the diet is ancestral and stems from the Paleolithic era, which started 2 million years ago. Despite the fact that during said era disease was rampant and people lived to an average ripe age of 30, they reason that it's good for you because it's what your ancestors ate. What I'm going to say may be shocking: Your two-million year old ancestors might not have been hunter-gatherers. They might have been growing their food. Without a doubt I am a definitive non-Paleo, but the purpose here is not to debunk the diet, although it is highly debunkable. Let's just compare the age. There is a bridge that connects India to Sri Lanka, that it dates to 1.7 million years old. It remained intact until 1480 BC when the sands under it shifted in a cyclone. It shows up clearly in NASA pictures of the earth, and is also written about in ancient texts. This bridge is called Ram Setu, or in the Western world, Adam's Bridge. Interestingly, though the bridge dates so far back, in the old texts it is said to be only 10,000 years old. Historians agree, however, that time is not properly accounted for in the texts, partly because anything older than 10,000 is too long for the mind to grasp, and partly because the epoch we're in is rife with corruption, including corruption in the perception of time. Let's assume the current dating methods are correct and the historians are correct. Let's layer the historical events from the ancient texts in order of time based on that. In such a scenario, it appears that Ayurveda has been around for longer than 2 million years. There is similar combined scientific and historical evidence of continuous agriculture in parts of India from before Adam's Bridge until now. Continuous agriculture in other parts of the world cannot be ruled out. It would appear that civilization, and its component agriculture, is much older than we usually give it credit for. Perhaps there were pockets of cave people and pockets of civilization coexisting in the world at the same time. But, in this equation, if the Paleo era started 2 million years ago, and Ayurveda was established before that, Ayurveda is older. What is an ancient diet, anyway? Who were your ancestors? What did they eat and how did they prepare it? How does it pertain to you now? Did you like this post? Subscribe to more articles about Ayurveda and a Vegetarian Lifestyle. We will never share your email with anyone else, ever. Can Eating Gluten Free Be Harmful to Your Health? If you are Celiac, this article is not about you. If you are Celiac we honor you for all the trouble you've had to go through and the work you've done in the world to make people aware of this issue and make a variety alternative grains available for yourself and everyone else. But, many people we know, including ourselves, are not celiac but often eat gluten free because we think it's just healthier. Or our naturopath or ayurvedic doctor has told us that it's better for us, for some sensitivity or other. Is this really true? Let's look at it from several perspectives. If you're eating out, you are likely avoiding the McDonalds, Burger Kings and other fast food joints and more likely eating Thai food, Mexican, Indian food or Sushi. By doing this you're not only avoiding gluten, but you're reducing your intake of other contaminants like trans fats, rancid meats and bleached flour. And while you're keeping away from the fast food joint, you're probably consuming fewer diet sodas with aspartame. Avoiding all these can only be good. Maybe you're eating at home more because it's generally not so easy for you to find what you can eat in restaurants at all. This is also good. By eating at home more, you know exactly what goes into your food, and you probably prepare it with love. Both of these things are crucial to health. So maybe you're actually making out healthier by avoiding gluten, because in the process, you're eating at home more often and ingesting less fast food and overall fewer toxins. But here's where the gluten-free panacea stops. No matter what you eat or what your dietary restrictions, there's no substitute for reading labels and knowing the source of your ingredients. Look at the packages of gluten free goods in your pantry. Do they contain any of these? If you are already eating gluten fee, I don't need to tell you that these are among the MOST COMMON ingredients used in gluten free foods, especially baked goods. Why, GMOs of course. If you have nut allergies and order a test, that test will look for proteins found in nuts that cause allergies. The addition of foreign proteins can only cause more allergies. Prana Foods is in the process of getting this very certification. We stand by our foods as GMO Free, even down to the trace ingredients. We declined to buy a certain brand of gluten-free chocolate chips for our cookies, because the cane juice had been processed with cornstarch that the company could not provide any satisfactory information on. Besides, we had a strong preference to make the cookies corn-free, and we found a way (and a tastier one) by buying our chocolate from a tiny boutique company that is free from every allergen we know of. We believe in eating variety. Eating Gluten Free can partly accomplish this but watch out for overdoing the usual substitutes. We have formulated all of our products to favor variety and give delicious, true alternatives to people, whether you eat gluten free or not. You can of course order our extraordinary products on our store page, or visit Manna Mills and buy them there! Eat healthy, eat happy and eat love. Are Humans Meant to be Vegetarian? A look at the science. Over the years, in different situations, a handful of doctors and natural practitioners have recommended to me a meat-based diet, as a possible cure for various small and large ailments. Along with that, some oft-quoted areas of concern (without a test, mind you!) are iron levels and vitamin B12. Incidentally, lentils (which we eat a lot of! ), beans, dark green leafy vegetables and figs are all excellent sources of iron. Now, I'm a strict vegetarian in the sense that I will not eat flesh for any reason. So, naturally if a doctor says that to me, I will scoff and seek another solution. But that isn’t the reason for this discussion. Let's set aside my personal bias and look at our own human physiology, especially our digestive system, as compared with natural carnivores and herbivores. *Short intestine, usually 1-3x the length of the body with relatively few twists and turns, optimized for getting meat through quickly so it doesn't putrefy in the gut, as well as highly acidic gastric fluids (20x more acidic than an herbivore) for easy digestion of cholesterol and saturated fats prevalent in animal food. No need for fiber to help things along because intestine is short. *Long intestine (10-12x the length of the body) with lots of twists and turns, suitable for absorbing the nutrients within grains (meat will putrefy in the gut of an herbivore 4 hours after ingesting), gastric fluids 20x less acidic than carnivores, little to no ability to break down saturated fats and cholesterol. *Night vision is relatively poor. Which category do humans belong in? You decide. I know, all the evidence here is stacked toward humans being natural herbivores. That’s just the way it is, folks! I’ve never seen a compelling argument for humans to be natural-born meat-eaters. Okay, if you're a staunch carnivore or omnivore yourself, (or even an admittedly convenient one) you're certainly entitled to your opinion, and your habits. Diversity is the spice of life, after all. But just for fun, here are all the “humans are meant to be omnivores” arguments I’ve ever seen or heard, and my rebuttals to them! 1. Neanderthals (our closest hominid relatives) were big meat eaters, so we must be too! Well...are you a Neanderthal? Last time I checked, I wasn't. I don't know about you. Whether we evolved from Neanderthals or not (which is a debatable theory, whether or not you are a creationist) you are (most likely) not a Neanderthal now and maybe shouldn't eat like one. 2. "Most" of the arguments for being vegetarian are based on morality or us being related to chimpanzees. Do you see anything about chimps (or morality for that matter) above? I don't, unless you think the herbivore generalizations meant chimps only! Oh...or if you think it's moral to have molars instead of long sharp teeth. 3. O blood types were naturally hunter-gatherers and need to eat meat to be healthy. While the blood type diet is a noble idea, it isn't a complete theory, and the science behind early humans being hunter-gatherers is purely erroneous. Unfortunately in the West we are ridden with so-called "science" that is half baked and doesn't take into account the tens or hundreds of thousands of years of history of humanity and our eating habits for that entire period of time. For many thousands of years before "hunter-gatherers" graced the fertile crescent, humanity in so-called "pre-historic" (read pre WESTERN) societies (aka India, China, etc) engaged in agriculture. 4. I feel better when I eat meat, so it must be natural to me, and everyone else who chooses not to eat it is denying some basic instinct. Um, I'm not going to argue with your comfort level or preference. But, if you're comfortable with it, it's because you grew up eating it and so, yeah, it's a comfort food. But as for everyone else...they can speak for themselves. I'll speak for myself...meat (uh, like roadkill? or other dead flesh?) is gross. I became a vegetarian 13 years ago, almost out of curiosity. When I did, I was afraid my hair would lose its lustre and my nails would get brittle, or my skin would turn ashy. Au contraire! My nails grew better, my hair got more volume and lustre and my skin, while okay before, began positively to glow. And it was a benefit not only in terms of vanity. Food tasted better too! While before, there was black and white (the meat and non-meat), food turned to a multitude of tastes, textures and colors. I have never eaten better than since I've been vegetarian. Oh, and, rumor has it, vegetarians smell better, too. 5. You need animal fat to be healthy. While the "Nourishing Traditions" Sandy Fallon Weston A Price diet is well-intended and a nice idea for returning to nature, its bias is based solely on dental study of ONE culture. It does not take into account other cultures, who for thousands of years have been flourishing vegetarians. Furthermore, it is unscientific in that it does not take into account the other lifestyle aspects of that culture. It isn’t “double blind” in other words. Don’t get me wrong—that book provides a lot of useful information on the benefits of raw and fermented foods (which have their own arguments in favor). I’m a raw milk drinker myself, a homemade kefir drinker and extol the benefits of both to many I come across. Also that book provides a lot of useful information on soaking grains for maximum digestibility and enzyme benefits. Its basis for looking to ancient cultures for good nutrition is exemplary. Much can be learned from it, but the meat and dairy argument is not the be-all end-all. If there's a good meat-argument I left out, feel free to comment! Let's go head on! Vegan and one Lacto-vegetarian source of B-12! Vitamin B12 sources are an oft-made-fun-of area for vegetarians, vegans especially. It is the popular belief that there is NO vegan source of B12, and that it only comes from meat or supplements. This is completely wrong! Vitamin B12 occurs through the process of fermentation and has little to do with the medium it is grown in. Here is a list of some of my favorite vegan and vegetarian whole food B12 sources that are easily obtainable. *Chlorella tablets or powder (a green algae --great for you anyway, they also have a complete amino acid profile and as well detox you from a multitude of things including heavy metals.) Okay, I confess this one comes in a bottle and is considered a supplement. But, it offers plenty of benefits in addition to B12, and it really is a whole food. It’s an algae after all. *Miso (a superhealthy, high protein, digestible soy or chickpea food!) makes great soup and dressing, best consumed raw. *Homemade kefir (only if you drink milk) - I don't know whether tibicos/water kefir contains any B12. I haven't found any information on that. *Most any fermented food can be cultured with “Aspergillus oryzae.” This is a botanical name for Vitamin B12. You can look for this on labels. It might also appear on tempeh labels and those of other interesting fermented vegetarian foods. Heck, maybe you could even throw it in kimchee or sauerkraut! This recipe is great served with Prana Pancakes, Dosa Style. It can be made for breakfast, lunch or dinner! Hing or Asafoetida--Get this at your local organic coop instead of the Indian store if you are gluten free. The Indian store kind has wheat flour in it. Turmeric – definitely buy this in your local coop because the Indian store kind is usually cut with yellow powder, it is not authentic. In a medium pot, rinse a cup of yellow mung dal several times until the water runs clear. Then add 4-5 cups water and bring to a boil. Once it boils, turn it onto low and simmer for 20 minutes. Set the timer. For a complete meal, rinse some rice and set it to cook the same way as the dal. The two together make an excellent protein. While the dal and rice are cooking, you can go away for a while and relax or meditate. J If you need more time for your relaxation process, set the timer accordingly! When you come back, check on the dal. It should be soft through and it can be mushy. It takes just as great. If it’s cooking slowly turn up the heat a little during your next process. The rice will be thoroughly done after 20 minutes. You can just turn it off. Coriander powder (you can grind it easily in a coffee grinder, but have a separate one for your spices or your dal will taste like coffee!) also fine to grind in a mortar and pestle. Make sure you don’t overheat these. Turn off the heat. Puree the tomato/tomatoes with a handful of curry leaves, about 10 or 20, in a little water. Turn on the skillet again till it’s hot and add the tomato mixture so it sizzles. Bring that to a boil and add it to the dal which has cooked. Blend it together and add salt. After it is cooked and you have taken it off the heat, wash the zucchini and pick off the little brown end with your fingernail or a knife. Then, grate the zucchini, raw, directly into the pot of dal. If you have a Microplane it works great for this, but watch your fingers! Serve it in large bowls over rice. The zucchini will “melt” in the heat of the pot and go down easy, yet still retain some enzymes. Even our son loves it. Enjoy! Come See us at Vegfest! We're at Vegfest this Saturday and Sunday at the Seattle Center! Come sample our fabulous cookies. You'll wonder what's in them by the list of what's not! We're at table 142, right across from the stage. Also come check out our new eco-friendly packaging. The new bags are hand stamped! No need to waste paper on extra labels. Hey, you can find us on google now! Hey, guess what? You can find us on google now. :) Cool, huh? Many people had written to me and asked why they couldn't find us on google. :) Well, guess what, now you can! Because I added the url...that simple. Ta ta for now! It was soooo good. I didn't realize Prana Pancakes can actually make an excellent cake! But before I divulge a recipe, I have to consider whether to wait until after the recipe contest is over, or just give it now! But the recipe contest aside, I really do need to make it again, because as usual the first time around, I didn't measure anything. So I'll have to make it again (maybe more than once?) It depends on how well I guess with spoons and measures in hand instead of the old toss. Stay tuned! Did you know that chanting, like prayers, have a powerful effect on yourself, your immediate surroundings and the world? Prayers have a powerful effect, scientifically, because of the power of intention. Mantras are similar--but the effect is greater. Why? Because the sound in a mantra *manifests the meaning* without doing anything other than uttering those syllables. A good analogy for it is that a mantra is like an algorithm for a desired (and specific!) uplifting effect in the Universe. Try chanting Om Namah Shivaya 108 times twice daily if you want to see the effect in your own life. Do you know--we chant mantras while we make Prana Pancakes? Maybe that's the real secret of why they're so good! Welcome to the Prana Pancakes Blog! I hope you like our new website! Our goal is to bring you relevant health information, great recipes and occasional words of wisdom to inspire and uplift. For today, here's a great raw salad recipe that tastes fabulous on the side for brunch with Prana Pancakes--and with many, many other things. Method: Wash and grate the zucchini and set in a bowl. Wash and dice the tomato, add it to the zucchini. Mince or food process the olives for just a few pulses, removing any remaining pits. Salt to taste and add a pinch of your favorite vinaigrette if desired.